Being trapped results in physical experiences beyond those caused by the immediate environs in which you are stuck. You feel it in your muscles, in your chest, in your throat and in your stomach. It is, to say the least, uncomfortable. While I can’t claim to have ever been thrown behind bars, with no good options and for no good reason, I can safely say that this is likely at least some of what it feels like to be victimized by the unjust money-bail system. And we hope—strangely enough—that some of this translates into what you feel playing the Bail Trap game. Yes, you read that right. We have made a game designed to frustrate, aggravate, and agitate you. We want you to play a game you cannot win. It’s not what we usually do. We are filmmakers and we usually tell stories. But we tell those stories because we are trying to create connections, to make viewers understand—viscerally in some cases—why a wrong needs to be righted, why a system must be overthrown, why individuals must break out of their comfort zones and get involved. Today we are working with a broad coalition of leaders working to end a system that offers one kind of justice for the rich and another kind entirely for the poor. We have told real stories, like that of Tai Sherman, a young woman with no criminal record whose college plans were derailed when she was held on $100,000 bail because an acquaintance was arrested for shoplifting $38 worth of dish soap and such from a Bay Area CVS. We have exploded myths about the money-bail system. And we have combined film and poetry to paint an emotionally resonant picture of how the repercussions of this system ripple outward in lives and communities. This game is another way in. The reality is, we can’t and do not pretend to be able to make someone feel, through a video game, the depths of despair and hopelessness that must surely accompany having one’s freedom curtailed and the fallout thereafter. But even a little spark of intense frustration may help someone out there understand, just a little better, why a system that locks people up for the crime of being poor must be overthrown, immediately. Think you can make your way through money-bail system without getting trapped? Try it. 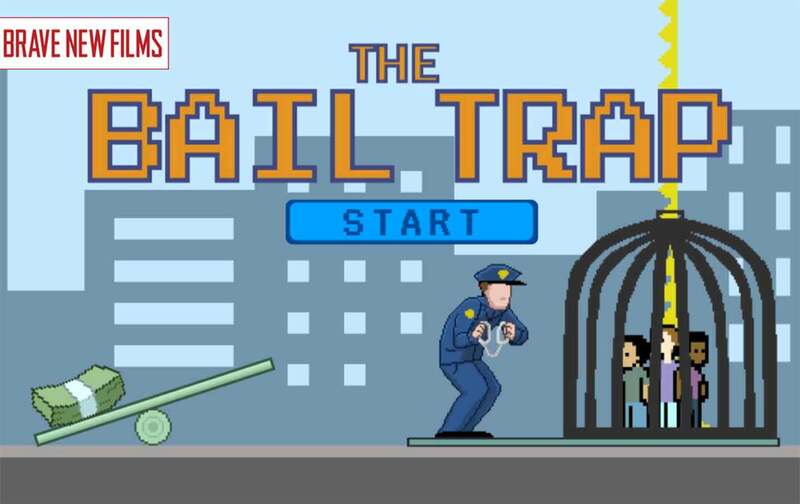 See if you can figure out how to beat the Bail Trap game. When you’re done playing, pick up the phone. If you’re in California, call your Assembly member. If you’re not in California, e-mail Senator Kamala Harris to get involved on a national level. Tell them that in real life there is no reset button, no cheat codes. We made this mess, we have to clean it up. It’s time to #EndMoneyBail once and for all. Go to bravenewfilms.org/thebailtrap to find out more about fighting back against money bail.